Wonderful winter! Frost and icicles everywhere, white snow and walks on the frozen rivers. Skating on the flooded roads and tracks. Wonderful. I love winter. In fact, I love all the seasons. I have also lived in places where there are only two seasons, dry and wet. That gets boring after a few months, though. No, I prefer real seasons. Here in Winnipeg, all seasons are clearly there, one at a time. Sometimes a season may be a little short like last summer, but anyway it was nice to get a few days of warmth. 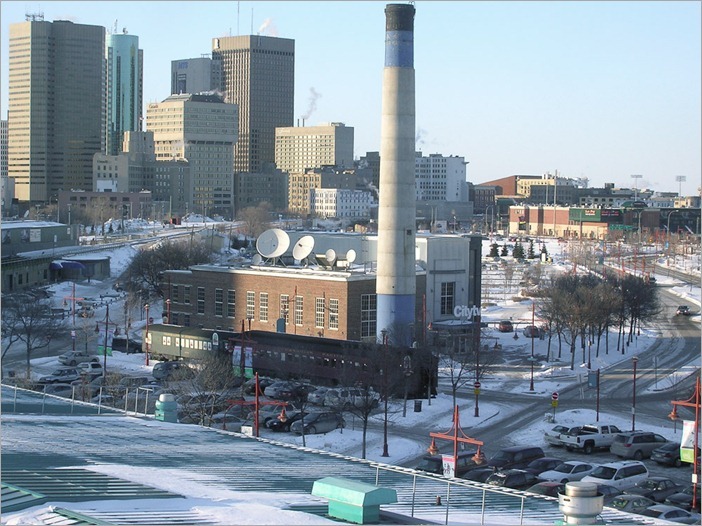 This is what Winnipeg looked like when I arrived here for the very first time. I believe it was the day after my arrival, still jetlagged, that I went up there to contemplate the city. Completely snowed in, but clearly alive, the city. In Europe, if we get 5 snowflakes within a minute all traffic grinds to a halt. A few more snowflakes and even public transport shows signs of trouble. Here, everything continues as usual. Wow! 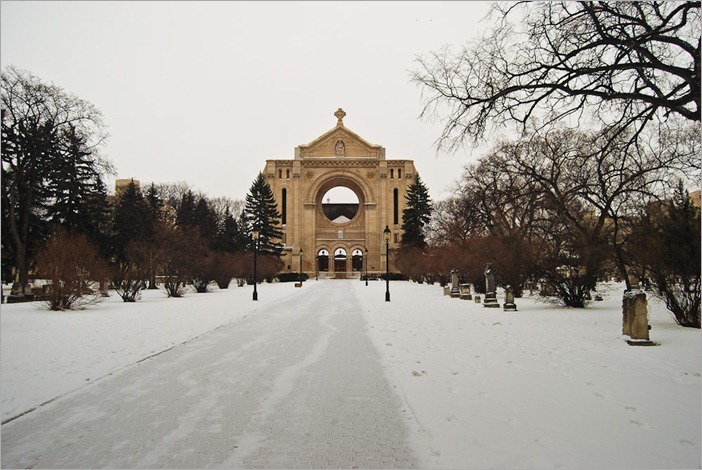 The next striking view in the city was St Boniface. Not familiar with its past, it looked like a ghost. Seeing the graveyard in front of the church was kind of a shock to me. In Europe, graves are to be visited by those who really want to and not to be seen if you’re not in the mood. And then there’s that round hole in that wall… Easy to understand that that was a glass window, but then again: why did they leave that facade standing all by itself? The answer came later. The wall contains the remains of cardinals. They )the remains) had had a very heated time in the fire of 1968. But still this wall was a grave and should never be removed. So, the facade stays, the new cathedral is built behind it, on the premises of the old cathedral. Then, getting back to a place a bit livelier, I came across this snow sculpture. Who would want to do something like this? 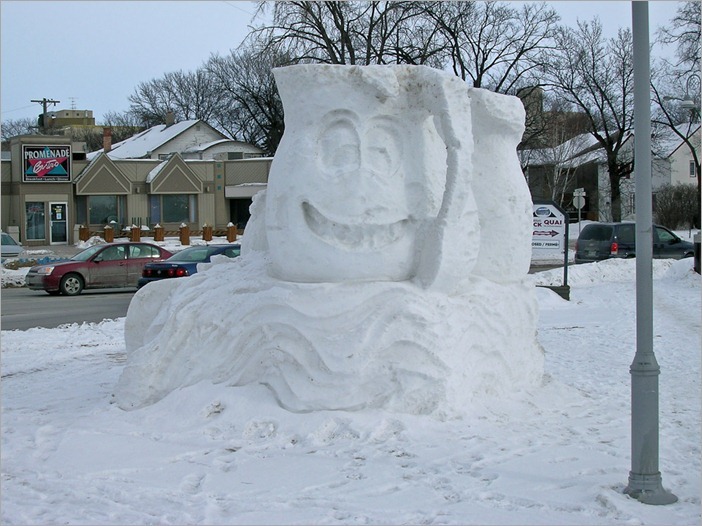 As it turned out, they do it every year, here in Winnipeg, for the “Festival du Voyageur”. And since I arrived only in March, that particular festivity was already over. Only the snow sculptures remained. The Festival du Voyageur is a mainly French festival where English speakers are also welcome. It is about tradition and travel. A very nice festival, I’ll talk more about it another time. 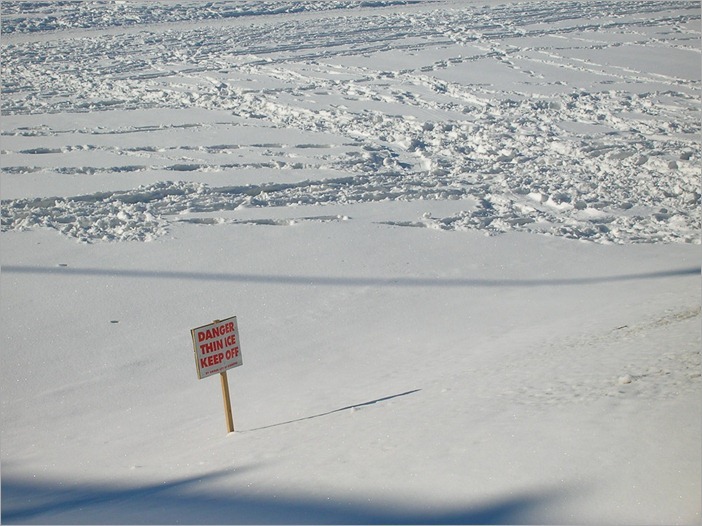 Walking back to the Forks, well this little sign is not very inviting. Seeing the tracks of people only a few meters away from it kind of undermines its authority. The ice on the Assiniboine gets as thick as 60-70cm. On the Red River 50-60cm. 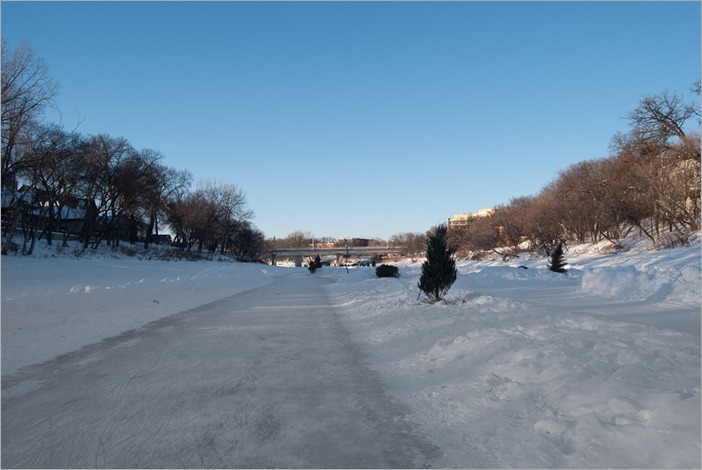 Well, if that is called thin ice… So a little further on the river you can see the skating trail. The Festival du Voyageur is mostly responsible for the trail and its signalisation. The little sign above is put there by the city. The skating trail that year was the longest in the world and has been recorded by the Guinness Book of Records as such. The skating trail is prepared with small bulldozers, then flooded in the evening to get nice flat skateable ice (is that a word? Skateable?). It seems like all the left over Christmas trees are also used for decoration on the trail. A nice touch. Some people have asked me if the trees grew there… I have my doubts. Going a bit out of the city you can get in a re al different world. Abandoned houses and farms are not common in Europe. It seems that here the land is not so much needed. 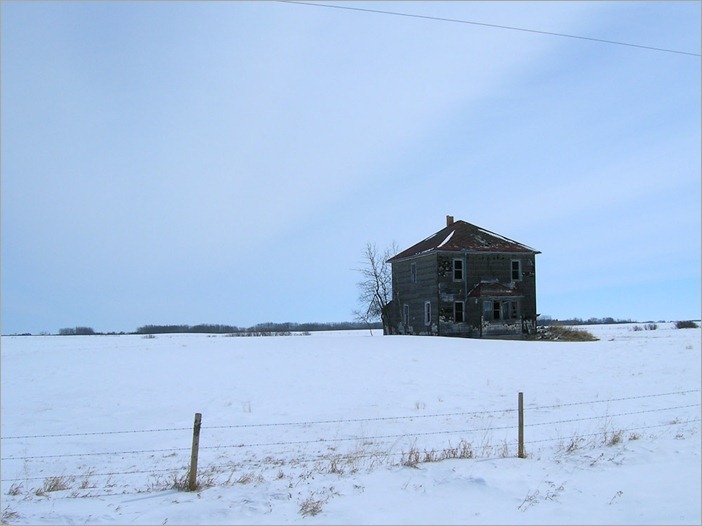 Old farmhouses and ghost towns can still be found in Manitoba, Saskatchewan and other provinces. This picture was taken in the bright sun. My P&S really did a good job. It appears that the trees that were growing around this place have been cut and used for other purposes. Otherwise it would have been a real cold place to live in. 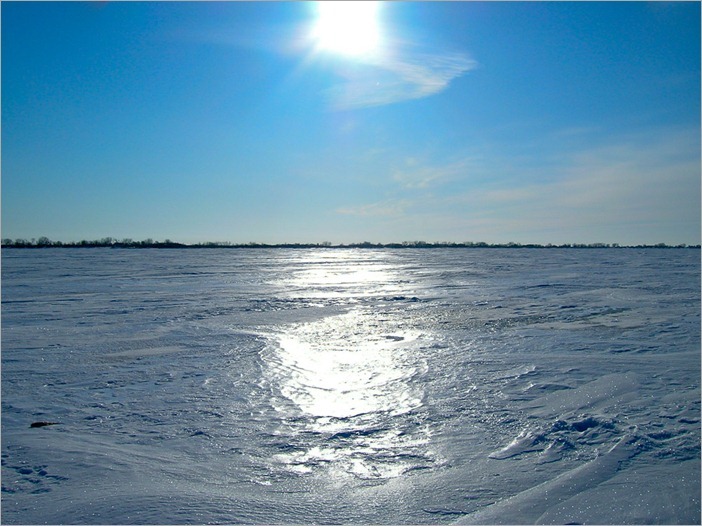 Going back near Lake Manitoba, a view from the ice to the land and the sun is rather magic. The lake was covered in hard snow and ice. However I was not cold. To say it was tropical is a bit of an exaggeration though. The view to the shore was great, Around me all there was, was white snow and ice, blue sky and a bit of land, far far away. I really would like to do this again one day. I probably will, if you can wish it, you can get it. It’s all a matter of time and timing.